Last month, I urged you to think strategically while conducting an annual review of your business strategy to gear up for 2016. Analyze the big picture of your business by reflecting on 2015 overall, reviewing the current state of your organization, revisiting your Big Hairy Audacious Goal, agreeing upon industry and market trends, and conducting a SWOT analysis. 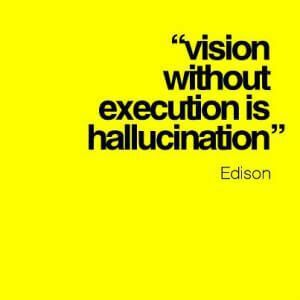 This month, I am going to discuss the next step in the annual planning process: Execution Planning. After you have a clear vision of where your company is today, and you understand what challenges and opportunities may lie in the future, it is important to define the actions that will take you where you want to go! You have already identified your 10+ year goal (your Big Hairy Audacious Goal), but it is important to create smaller goals that will help to get you there. Create 3-year goals. Pick 2-4 S.M.A.R.T (specific, measurable, achievable, result-oriented, timeframe) goals you choose to achieve, and the top 3-5 priorities that MUST occur to achieve them. Some ideas could involve goals for your revenue, profit, customers, or product mix. Identify the “owner” of each priority and define what success will look like in this time frame. Looking at your 3-year goals, break them down even more to establish some 1-year goals that will feasibly get you to where you need to be. Pick 2-4 measurable, result-oriented goals you choose to achieve by this time next year, and the top 3-5 priorities that must occur to achieve them. Identify the “owner” of each priority and define what success will look like in this time frame. Lastly, break your 1-year goals into quarterly goals you will use in 2016 to identify if you are on track with your progress. Specifically focus on Quarter 1. Choose the top 3-5 priorities that must happen to achieve your goals, and identify the owner of each priority and what success will look like in this time frame. In order to execute the strategy, your organization will have to adopt a set of habits needed for success. Gazelle’s Rockefeller Habits were designed to maximize a business’s potential through in-depth assessments of strengths and weaknesses to create a solid plan of action that can help achieve your goals. To name a few, the Rockefeller Habits will help identify if your executive team is healthy and aligned, if everyone is aligned with the #1 thing that needs to be accomplished this quarter to move the company forward, and if communication rhythm is established and information moves through the organization accurately and quickly. Download the Rockefeller Habits Checklist here. Hone in on Quarter 1 and create an Individual Quarterly Action Plan that will focus on achieving your first quarter goals. Answer the questions “who does what by when?” when you are assigning steps to the priorities identified when defining goals. Your Individual Quarterly Action Plan should be communicated and collaborated within your team to create a culture of accountability within your organization. Your team is counting on you to do your part by your committed date, and in turn you can count on them to do their part as well. To follow through on the progress of the Rockefeller Habits and your Quarterly Action Plans, progress should be reviewed on a weekly basis. Goals will only be met if the steps needed to do so stay top-of-mind. Give each goal a green (on track), yellow (slightly behind and know how to correct), or red (need help and date or measure will not be met) status during these meetings. This is a great tool for communicating status, progress and updates to hold one another accountable. Make 2016 a great year by thinking strategically, planning your success actions, and continuously learning. Each month, I conduct a workshop to help your business continue to grow. See the 2016 dates and topics here. Our January workshop is titled “How Successful People Think.” Register today!